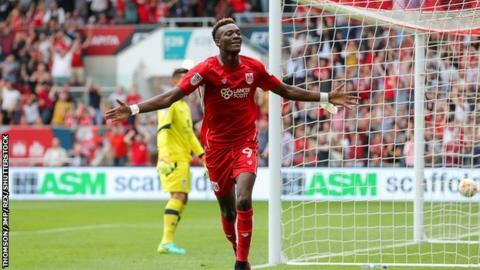 Bristol City scored three second-half goals as they came from behind to beat Aston Villa at Ashton Gate. The visitors took an early lead when Jack Grealish hooked in Leandro Bacuna's cross at the back post. But after dominating for an hour, the hosts made Villa pay when Pierluigi Gollini parried Lee Tomlin's shot and Tammy Abraham stabbed in. Minutes later, Abraham set up Joe Bryan who finished in the far corner, before Tomlin's spectacular 20-yard free-kick. City, who announced the signing of striker Jamie Paterson from Nottingham Forest at half-time, had lost their last two league games and were deservedly behind for much of this one. Villa should have added to Grealish's second goal in four matches, but Jordan Ayew missed two good chances to double the lead either side of the break, dragging one wide and blazing the other into the stand. City, without striker Jonathan Kodjia, who is reportedly on the verge of signing for Derby, turned the game around with two goals in as many minutes, thanks to Abraham's fifth of the season and Bryan's first. Tomlin then curled home from just outside the box to wrap up the victory, which left Villa still searching for a first away league win since August last year. "A lot of clubs are interested in Jonathan, but none have yet matched our valuation. We are in a position where we don't have to sell our best players unless a buying club comes up with sufficient dosh. "I left Jonathan out because of all the speculation, but nothing is signed and sealed yet. If he does leave we have contingency plans in place. "I was beyond anger at half-time. We were being totally outplayed and outclassed and we played with fear. I was so disappointed. "At half-time I told the players that I didn't care if we lost 5-0, we had to show the Bristol City spirit. "Full credit to them because we ended up trouncing a very good side. They are the third relegated team we have played and the first we have beaten, which shows how far we are progressing." "For an hour we were much the better side and in control. But when they scored we lost confidence and didn't look like a team any more. "It is not the first time that has happened and we need to work on it. At some point in a game you are going to come under pressure and we have to deal with that better. "We became like 11 individual players on the pitch and lost the organisation we had for 60 minutes. Conceding a goal seems to cause us to lose confidence and it's a mindset we need to change. "Bringing in new players will help us, but we also need time to work together as a group. Conceding three goals as we did was not something I had seen from the team in the previous four games." Match ends, Bristol City 3, Aston Villa 1. Second Half ends, Bristol City 3, Aston Villa 1. Scott Golbourne (Bristol City) wins a free kick on the left wing. Attempt missed. Jordan Ayew (Aston Villa) header from the centre of the box is too high. Assisted by Jordan Amavi with a cross. Foul by Gary O'Neil (Bristol City). Attempt missed. Mile Jedinak (Aston Villa) right footed shot from outside the box misses to the left. Assisted by Jordan Amavi. Offside, Bristol City. Lee Tomlin tries a through ball, but Aaron Wilbraham is caught offside. Attempt missed. Lee Tomlin (Bristol City) right footed shot from the centre of the box misses to the left. Attempt blocked. Bobby Reid (Bristol City) right footed shot from the centre of the box is blocked. Assisted by Aaron Wilbraham. Corner, Aston Villa. Conceded by Scott Golbourne. Jordan Amavi (Aston Villa) wins a free kick on the left wing. Goal! Bristol City 3, Aston Villa 1. Lee Tomlin (Bristol City) from a free kick with a right footed shot to the top right corner. Substitution, Aston Villa. Andre Green replaces Ashley Westwood. Attempt missed. Hördur Bjorgvin Magnusson (Bristol City) left footed shot from outside the box is high and wide to the left from a direct free kick. Lee Tomlin (Bristol City) wins a free kick in the attacking half. Mile Jedinak (Aston Villa) wins a free kick in the defensive half. Tommy Elphick (Aston Villa) is shown the yellow card for a bad foul. Substitution, Bristol City. Aaron Wilbraham replaces Tammy Abraham. Tammy Abraham (Bristol City) wins a free kick on the right wing. Substitution, Aston Villa. Libor Kozák replaces Ritchie de Laet.